After receiving their diplomas this year, 20 University of Wisconsin graduates, along with 55,000 others across the country, will also be commissioned as second lieutenants in the U.S. Army. Before they are commissioned into the Army, cadets must show a basic competency in cultural awareness and sensitivity, along with eight other outcomes, Lt. Col. Katie Blue, Department of Military Science chair, said. To help them gain competency, cadets undergo cultural role-play exercises throughout their training, Blue said. These exercises put cadets outside of their comfort zone and provide them an opportunity to practice interacting with someone from a different culture, she said. 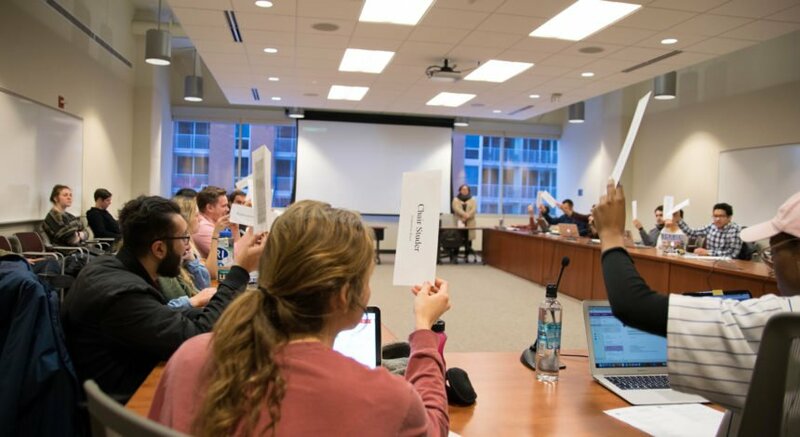 In March 2015, The Badger Herald was permitted to observe a cultural competency training, which on that day was centered on Iraq and Afghanistan. “I’m going to give you an introduction on Islam, about the religion and some of the cultures and courtesies around it,” Cadet Kyle Kazmierczak, a UW junior, said to a room full of fellow cadets. Reading from note cards, he recited the five pillars of Islam, as well as key religious terms like Quran, mosque and Ramadan, while the cadets took notes. 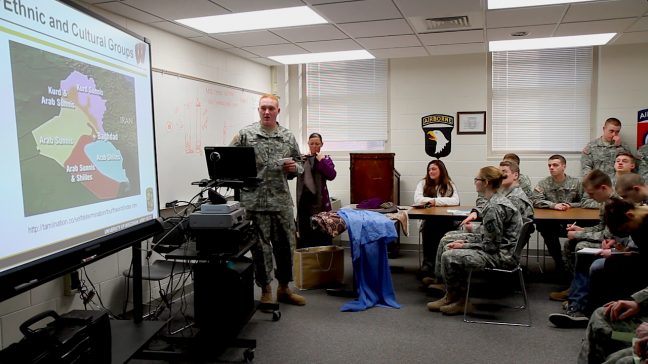 When his presentation came to a close, cadets filed out of the briefing room to begin a series of interactive role-playing exercises where some cadets pretended to be civilians from Iraq or Afghanistan, while others practiced interacting with them. Those acting as locals pulled stereotypical clothes over their camouflage uniforms. 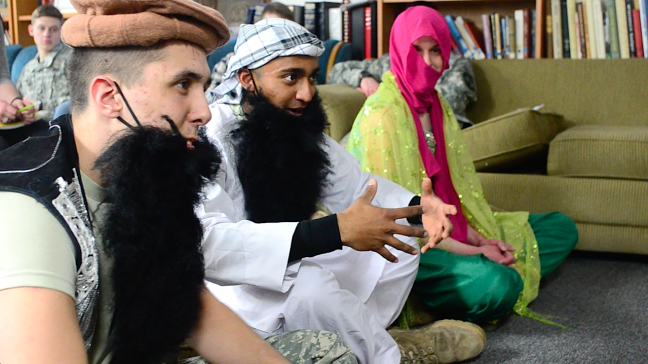 They wore fake black beards, headscarves and Afghan pakols (a round-topped hat). They carried fake AK-47s and began to use heavy accents. Everyone in the room seemed to be stifling a laugh. The key leader engagements began. 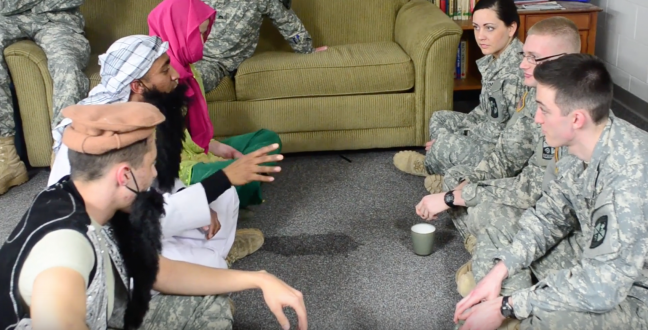 In one room, cadets rotated into an improvised interaction with a group of local leaders — three U.S. Army officers sat across from three locals and engaged in conversation attempting to bridge the supposed cultural differences between them. “What we came here to do is really to help you guys, so I want to tell you about my family, and I want to learn about you as well,” a cadet interacting with the locals said. A female cadet, dressed as the wife of one of the local leaders, entered with water for the visiting soldiers. “Thank you for the water,” one cadet said. In the next room, cadets practiced handling different possible situations when encountering civilians on the battlefield. Dressed up and using thick accents, the civilians entered the scenario in various emotional states. The Army platoon on patrol, armed with replica M-16s, calmed them down, asked for IDs and made sure they did not have any weapons. The interactions were unscripted, unorganized and hectic. In the final simulation, one member of the civilian group drew a gun on the patrol, which resulted in all three members of the civilian family unit being shot. Again, the room of spectating cadets burst into laughter. Building leadership or reinforcing stereotypes? For ROTC members who have accepted active duty scholarships, and owe a minimum four-year active duty obligation, there is a chance they could be deployed to Iraq or Afghanistan. Uli Schamiloglu, Middle Eastern studies program chair at UW, raised concern that without a substantive understanding of a region’s cultures, religions and values, role-play exercises, in which cadets dress up and impersonate locals, may reinforce problematic stereotypes for students and future officers who may not have had other exposure to Islamic cultures. Cultural trainings may need work, Blue said, but ROTC’s main focus is on laying foundations for careers in military leadership, developing a cadet’s character and presence and instilling discipline, army values and the warrior ethos. UW’s tradition of training military officers dates back to the university’s earliest years, when the first student organized military company, the “Light Guards,” left to fight in the Civil War in 1861. During World War I, UW’s military training programs commissioned thousands of officers, more than any other university in the nation, proportional to its size. 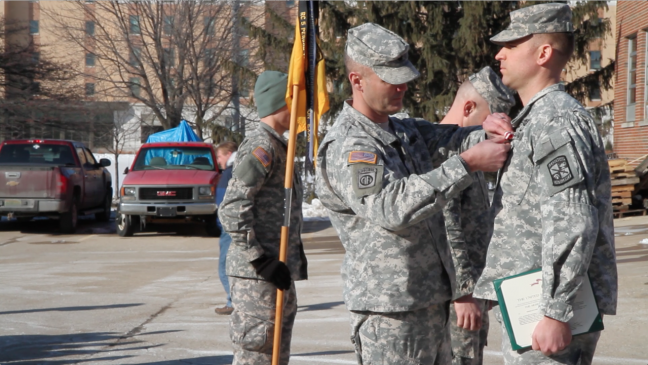 Badger Battalion, UW’s Army ROTC program, receives $1.4 million in federal funding each year to continue training and commissioning officers to fight the nation’s wars, Blue said. Officer Cadet Thomas Dittus, among those who will be commissioned this May, received a three-year active duty scholarship through Army ROTC. The scholarship covers tuition and book fees, in addition to a living stipend. Dittus was branched in aviation and will begin a six-year active duty obligation flying Army helicopters in October 2016. 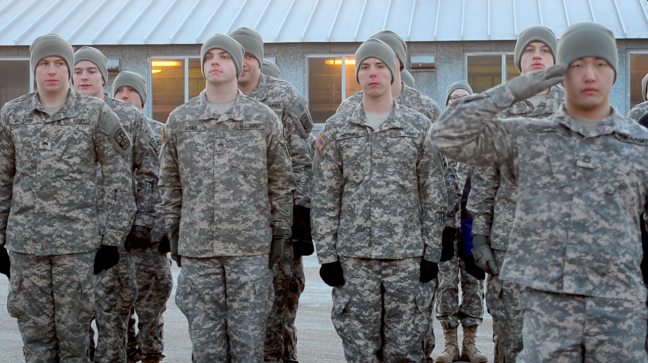 The strongest emphasis in ROTC is leadership training, Dittus said. This includes developing understandings of how to interact and build respectful relationships with local leaders in countries where an officer might be deployed, and where cultural and social norms may be different, he said. Dittus said cultural representations at the ROTC level are not accurate, but are only the beginning of much more serious and intensive trainings at the Army level. Once officers are assigned a region of deployment, they undergo intensive area-specific cultural training where natives from those nations act as the role-players, he said. Hani Rustom, UW Muslim Students Association president, expressed concern that while further training may occur, cultural trainings at the early stage of an officer’s career may do more harm than good. It is a particularly critical time to work toward accurately portraying Muslim cultures in America, especially in the military, Rustom said. Islamophobic sentiments have been normalized through constant misrepresentations of the culture through the media, and a certain diligence must be put on fighting these stereotypes in the training of military officers, he said. Blue said Army ROTC might consider reaching out to the local community for help with developing cadets’ cultural understandings of these regions. But she emphasized that before an officer actually takes command of a platoon as a Second Lieutenant in Afghanistan or Iraq, he or she undergoes hours of cultural training at a professional level. With three mosques and an active Muslim Student Association, Madison has a substantial Muslim population to reach out to, Rustom said. Receiving information about Islamic cultures from Muslim leaders on campus would be more effective in developing cultural sensitivities and understandings than role-playing, he said. 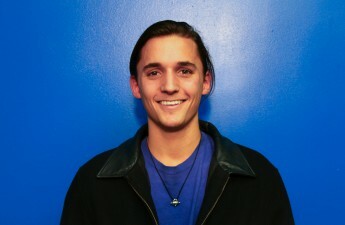 Rather than role-play, Schamiloglu said conversations should be taking place with people about their cultures.